Here is an exploration of the concept of elopement weddings. 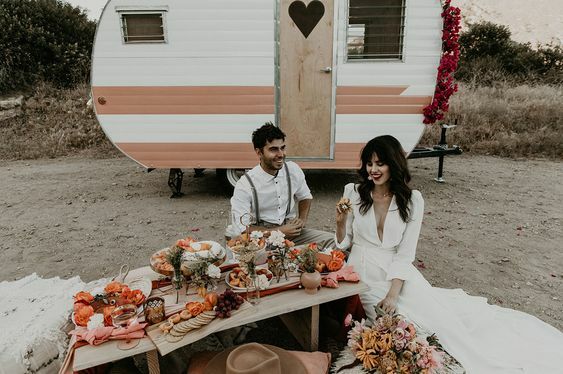 There are a lot of elements to consider to make an elopement successful, and this article will be about the concept, of what it means to elope. An elopement is a wedding that involves the bride and groom getting married without a traditional ceremony and reception with friends and family. It is usually the couple choosing a destination outside of their hometown to get married in a private and gorgeous setting. The minimum is the bride and groom plus an officiant and a photographer. If you choose to, you can have one or two witnesses and one or two family members. It can be cheaper and more enjoyable to elope. You have more chances of remembering your wedding day without the stress of a traditional wedding in which family tensions and expectations may drive you away from the enjoyment of the day. You can't share this special day with your closest family and friends, probably people who were involved in every stage of your evolving relationship with your partner. Many relatives may even be offended by your decision to elope. At the end of the day though, there is no wrong or right way to get married. Follow your heart! It is important to create a vision for your elopement that will reflect your personalities. Maybe a unifying color, a theme or specific details that will make this special day yours. Most of the details that are part of a traditional wedding need to be thought of in the context of an elopement: the dress, the bouquet, the rings, the arch, etc. Most elopement specialists emphasize the importance of taking the time to find the right photographer, as there will be no one else around to take pictures. Moreover, the pictures will be used to share the event with family and friends. The destination is the most important aspect of an elopement. Couples tend to choose a spectacular location to get married, like an iconic national park with a dramatic landscape. It can also be a location that has a special significance, maybe the small village where the two of you met while travelling abroad. An elopement also allows you to merge your wedding day with a honeymoon destination, which can save a lot of money. A wedding day in a gorgeous setting is also an opportunity to be at one with nature. There is something humble and spiritual about celebrating your love within nature, as though you were thanking the universe for allowing the two of you to cross paths on this planet. Getting married in this context brings plenty of opportunities to be grateful and playful: playing with the wind, the ocean, the trees. It is liberating to see that there are an infinite amount of ways to get married. Every option is accessible and acceptable. Enjoy the freedom of choosing to marry in your own personal way!